HANCEVILLE, Ala.--John Meeks has accepted the position as men’s head basketball coach at Wallace State Community College in Hanceville, President Vicki Hawsey announced this week. “I am confident that Coach Meeks will continue to move our program forward, building on the outstanding success of Coach Allen Sharpe,” Dr. Hawsey said. Meeks joins Wallace State from Louisburg College, where his overall record since 2008 was 51-15. During the 2009-2010 season, the Hurricanes were NJCAA Region X Tournament champions, and advanced to the Final Eight of the National Tournament. With a record that year of 29-7, Meeks was named 2010 District 15 Coach of the Year. Sharpe took over as head coach at the University of Arkansas at Monticello in May after five years at Wallace State. During his tenure, he established a 136-30 record and led the Lions their first NJCAA National Tournament appearance, where they finished fifth. The Lions enjoyed a perfect season in 2008-2009 and were ranked No. 1 in the nation. Meeks said he’s already hit the ground running, working on recruiting players to fill available slots on the team. One of his strengths is recruiting outstanding talent. Ten of his former players advanced to professional participation, and a number have received All-American, All-Conference and All-Region honors. His experience has included instruction, and he considers himself not only a coach but also a teacher, stressing that student-athletes remember the reason for attending college first must be academic preparation leading to a degree. The elements Meeks believes are necessary to create a winning team are these: an intolerance of selfishness, team, loyalty, sacrifice, motivation, effort, discipline, enthusiasm, pride and confidence. Prior to Louisburg, Meeks served three years as assistant coach at NAIA Lee University in Cleveland, Tenn. During his final season there, the Flames finished 33-2 with a Southern States Athletic Conference Championship and an Elite Eight finish at the NAIA National Tournament. His experience also includes serving as Assistant Men’s Basketball Coach at Martin Methodist College and as assistant men’s basketball coach and head Men’s Junior Varsity Basketball Coach at Bluefield College in Virginia. In eight years of collegiate coaching he accumulated more than 200 wins with six national tournament appearances. He holds a master’s degree in education from the University of Houston, and earned a bachelor’s degree from Bluefield College. 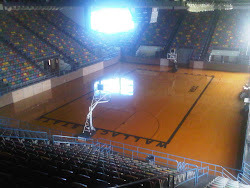 For more information about Wallace State men’s basketball, visit http://www.wallacestate.edu/.